Support multi-language menu display, voice operation prompts and alarm SMS setting. But App and manual instruction only in English at present. Connect WIFI, no need wiring, easier installation. App remote control, Wifi free push messages, more simple, more economical. 1. H36 panel will push alarm notification to your android or ios phone via WIFI when someone break in your house. 2. 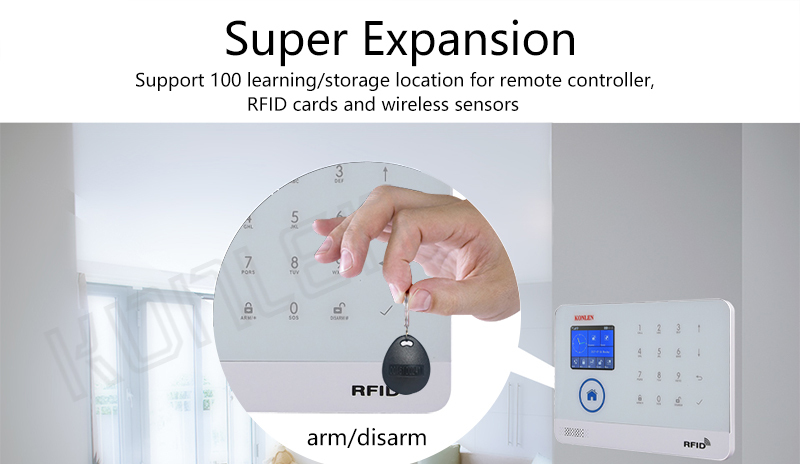 You can also remote control H36 ARM/DISARM by using APP. If your home no wifi or wifi signal unstable or wifi router power off, you can use gsm SIM Card network. 1. Insert GSM SIM Card to H36 and save your phone number to panel. When alarm system be triggered, KONLEN H36 will atuo call and send SMS to the preset phone numbers. 2. You can also remote control the alarm system by using App. When you receive notification, you can click the camera's button on the App to monitor your house. Tips: 1. Users can add endless IP network cameras in the App. 2. 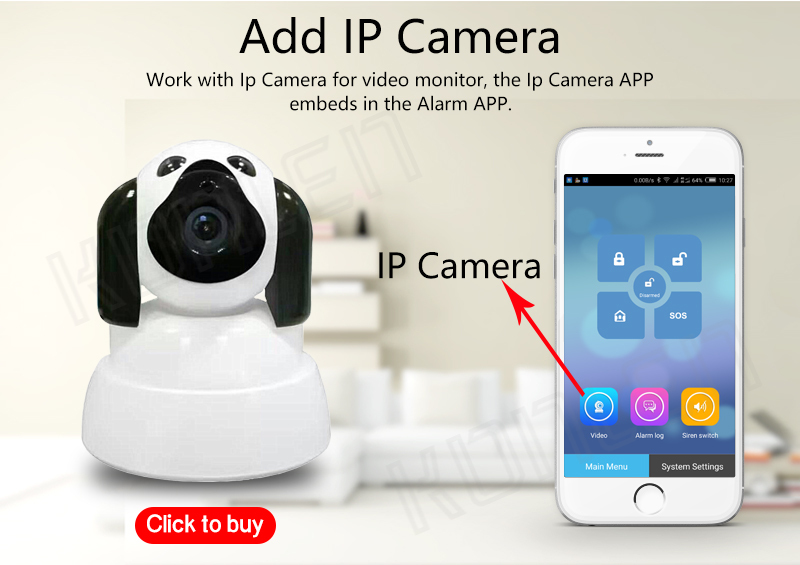 You need to buy the IP camera to work with H36 addtionally. 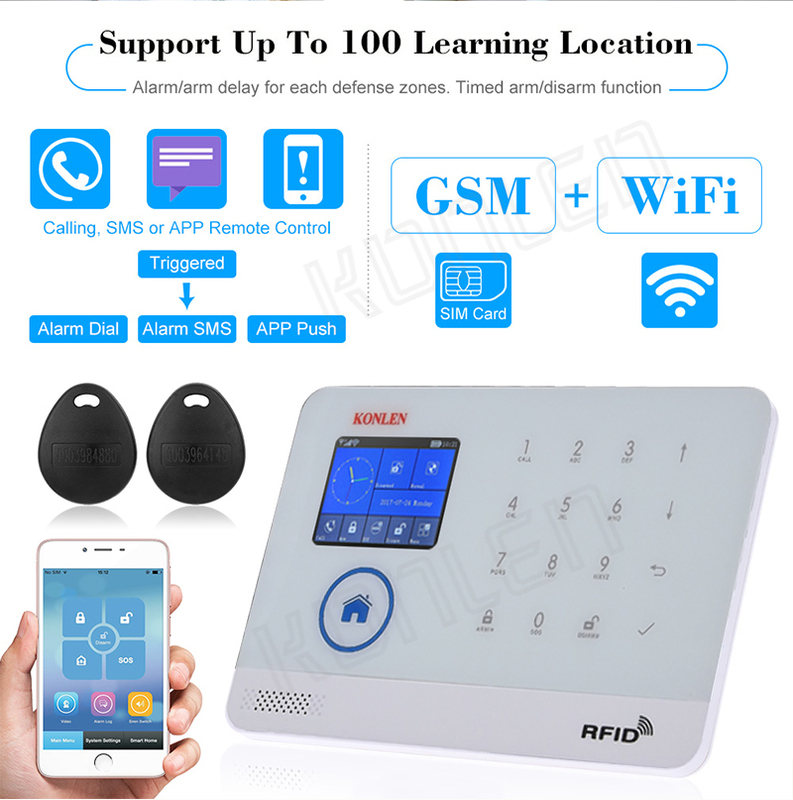 Support the door, Living Room Alarm, Panic Alarm, Bedroom Alarm, Window Alarm, Balcony Alarm, Perimeter Alarm, Fire Alarm, Gas Alarm, CO Alarm, Leakage Alarm etc zone name settings. Before use, please make sure the power switch of PIR motion sensors is ON. Installation height is about 2.2 meters above ground. When thieves walk through the detection area, PIR detector is activated to send wireless signal to H36 alarm panel. H36 makes alarming. 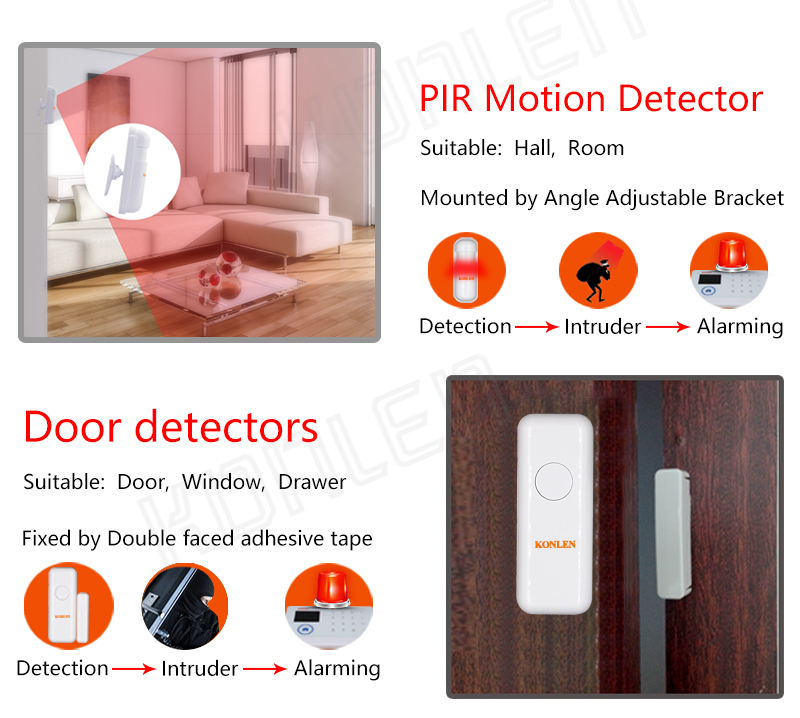 Door sensor is used for sensing the closing and opening state of the door, and is consisted of transmitter and magnet two parts. It can be installed on doors,windows or any object that can be closed and opened. When transmitter is separated from the magnet, door senser will send alarm signal to H36 alarm panel, H36 panel will alarm.